The former Bowie's Restaurant, which closed in December of 2012, re-opened as Bobby K's Roadside Cafe in May of 2013. 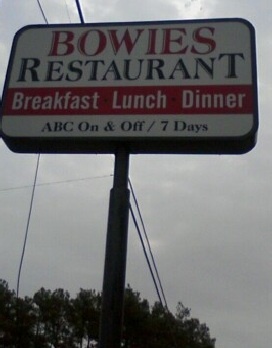 At the corner of Route 3 and Route 664 in Oak Grove, is Bowies Restaurant. It's pronounced "boo-wees" and sits right next to a hardware store of the same name. This is a spacious restaurant, with a large main dining table and several smaller tables as well as a bunch of booths for seating. Windows all around the dining room area let in plenty of natural light, and there are shades which can be drawn in case the sunlight becomes too strong. While I have eaten lunch and dinner here, my favorite meal at this place is definitely breakfast! Yum! They open up bright and early at 6:30am for the morning crowd. 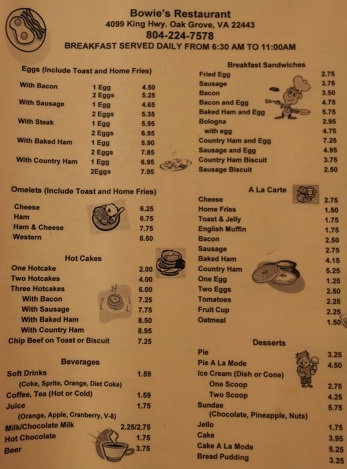 I have tried a number of items on the breakfast menu, and my favorites are the "3 hotcakes and sausage" and the "western omelet" which is absolutely huge. The home fries here are delicious, and breakfast items typically come with toast and jam. Couple that with fresh hot coffee and refills and your day is off to a great start! My hubby tried the crabcakes for lunch and he said they were very good. The prices are reasonable and the waitstaff is friendly. This place recently became non-smoking facility, and there's plenty of free parking available. In fact, every time I drive by, there are lots of cars parked around the building. If you're headed down Route 3 to visit some of the great local attractions like Stratford Hall, Westmoreland State Park or Washington's Birthplace you should stop here for a meal on the way to or from your day trip destination. Bowies Restaurant 4099 Kings Highway, Colonial Beach, VA 22443 phone 804-224-7578. Closed Tuesdays.